I like hills. Looking at them. Driving over them. Running down them. And sitting on them. I’ve left my footprints in the hills of Ireland and southern England, British Columbia and Italy. 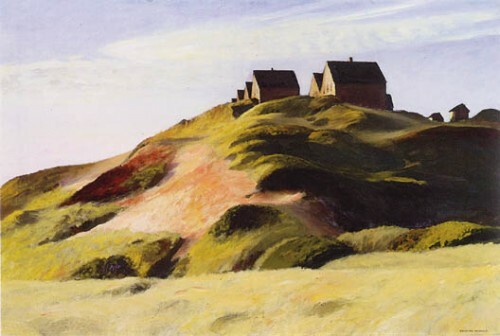 I even crossed a field similar to the one pictured above from my favourite Edward Hopper painting, Corn Hill (Truro, Cape Cod). Last December I went down to San Antonio, in part, so I could stand in silent communion in front of the painting in the McNay Art Museum. 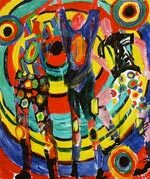 Zigzagging up and down the aisles of Toronto’s One of a Kind Show a few years ago, I came face-to-face with the hill country paintings of Michele Rose, an Oakville artist. Rose’s “Summer Morn” (above) now hangs above my desk. It reminds me of the many times my dad and I navigated the twists and turns of the Sussex countryside (en route to visit the rellies) in our sporty rented compact. I thought you’d appreciate a detail. Here’s the last hill painting I’m going to show you before we break for the weekend. It’s by the Ottawa artist Andrew King, who used to be a cartoonist for the Ottawa Citizen. This canvas, also on my wall, is entitled Dinner Call. I bought it because, as kids, the same wooden sled hung in our garage. Also, whether it was winter or summer, my mum used to fling open the back door and holler at my brothers and me to come inside for dinner or our bath. The whole neighbourhood knew when she was cracking open the Mr. Bubble. Let’s fade out with Cat Stevens.